If you’re looking for a way to see, at a glance, what the monster you’re fighting in Monster Hunter World is weak against, this cheat sheet will do just that. Monster Hunter World, as the name suggests, features many different monsters. As you’ve hopefully learned from our big Monster Hunter World guide, they’re not all created equal. Outside of the difficulty and size variance, they’re different when it comes to the elements they’re weak to, and the ailments they’re more susceptible to. This is why, for instance, Anjanath is immune to fire, but takes increased water damage. 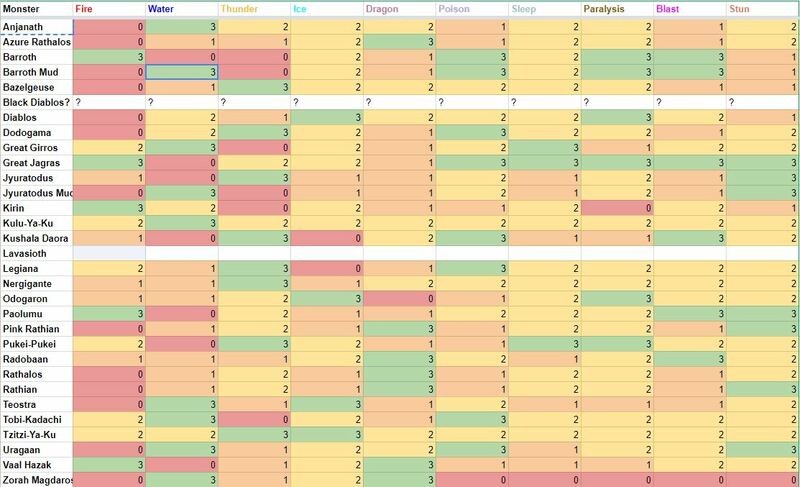 To help keep track of all such nuances, Reddit user Azuraith4 created a big sheet showing all monsters and how the various elements and ailments affect them. You can see it in full at the link, or in the image above. 3 = strong against, 2 = neutral, 1 = weak against, and 0 = immune. This should help you be most efficient when hunting these monsters, but also give you a hand when you’re trying to figure out why certain monsters wreck your armour. If you’re looking for more granular look at each of the big monsters, how to best prepare for the fight, and other important tactics, be sure to bookmark our Monster Hunter World guide. You can easily find the monster you’re looking for in there, as well as more general tips about the game’s many mechanics.